After a rather beautiful but actually not quite summery 3in1 I wanted to knit another jumper for myself. 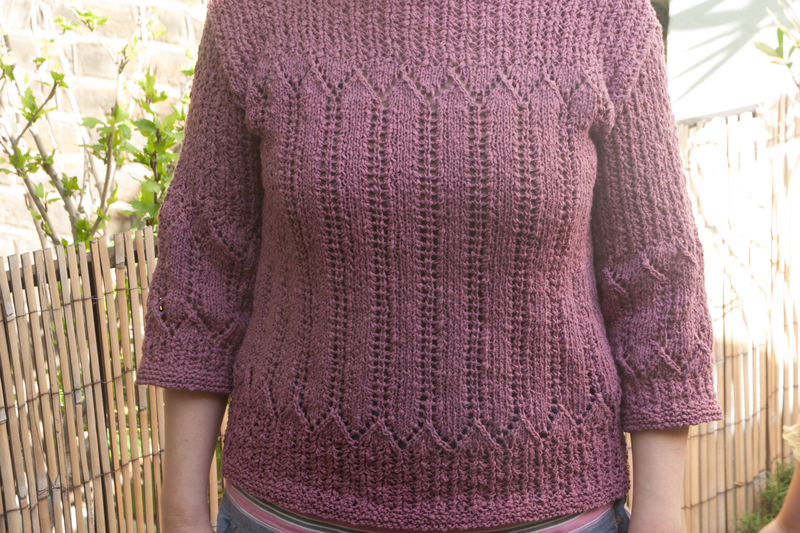 I really liked the Rowan Savannah – a cotton and silk blend in really nice shades – and was looking for a pattern. To be on the safe side I decided to buy the Rowan Summer Textures booklet to knit Navajo – a pattern designed for that yarn. Now, the pattern itself would probably be worth its own post but lets just talk about my mistakes for now. First of all, I realised quickly that the jumper would be far too short for my liking so I ordered another two balls which were obviously from a different dye lot and very even visibly different from the others. I decided to knit the ribbed parts at the bottom in the new dye lot so the colour change would go hand in hand with pattern change and therefore be less obvious. That worked really well. Until I reached the rather hidden section of the front – chest height – where I confidently checked the ball numbers. And took the wrong dye lot to continue. Can you spot the line? Once I realised that I had only balls from the same dye lot left, I could easily see where I had gone wrong. On the picture it is hard to spot but you can actually see a line just under the top zig – zags and one would be just under my chest – another classic example of me not only making an easily avoidable mistake but also whilest being fully aware of a potential source of errors. But all that nothing compared to my other, in the end rather useful, ahem, lets call it creative interpretation – the mystery of yfwd (yarn forward round needle)and yrn (yarn round needle)….. When I started using English (as in the language spoken in many countries all around the world) patterns, I came across YO (yarn over) first, found out what it meant in German and did it. Later I came across Ysomething and found out that it was YO in English (as in the Pimmsdrinking teasipping country I currently enjoy living in) knitting. Now, when knitting the Navajo, I suddenly realised that both terms (yfwd and yrn) were used. Which might possibly mean that they could be two different things. So I googled and watched a tutorial on youtube. I watched it without sound as I did not want to attract my two lovely children who would have taken that as an invitation to watch a series of nursery songs on youtube. And I stopped at 1.45min. Obviously there was no need to watch the remaining 3min or listening to the accompanying explanations …. So for all those who know what yfwd means, go to 1.35min and watch without sound for about 10 sec …..
After this amazing revelation (If I had listened to the accompanying explanations OR watched the rest, I might have realised that this was the “how not to do it” part), I incorporated the “new” technique in my knitting (I had to do it about a zillion times only) and decided to not only write a post about the YO mystery in English knitting vocabulary but also to create some kind of tutorial. 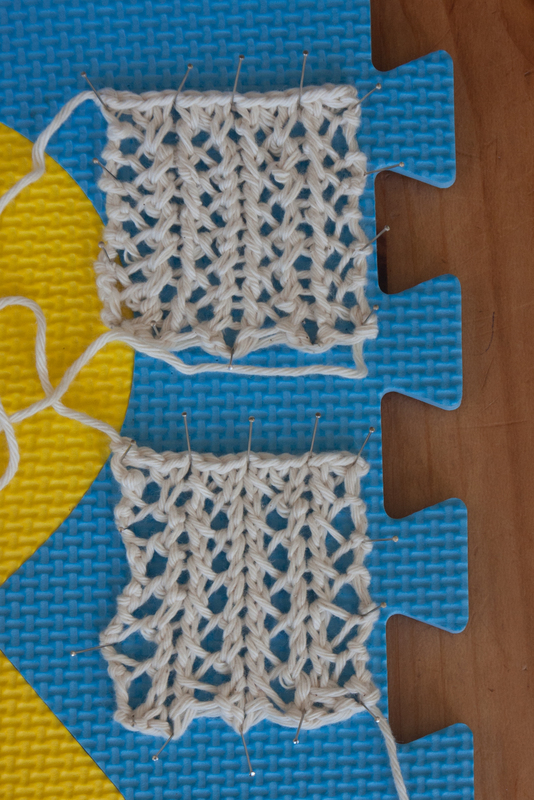 After I had found the brilliant Let me explaiKnit I gave up on the own-post-idea as it is all there anyway but I still wanted to take pictures of the differences, knitted a few samples, consulted my knitting book for some reason and realised ….. there are NO differences. I mean the result is always the same. The Ysomething goes from the front over the (right) needle to the back. There is no need for a yfwd, a yrn and a yon. If you still want to know, check out Let me explaiKnit! This is now a serious question to all those English knitters, please correct me if I am wrong, because I might be missing something that comes natural when you knit continental style? Are not all three basically the same? No matter if you are between two knit stitches, two purl stitches or a knit and a purl stitch, you start with the yarn in front (so yes, if it is initially at the back you need to bring it forward), you put it over the right needle to the back and you continue with whatever you need (which might mean that you need to bring the yarn forward for the next stitch). As much as I appreciate the attention to every single step when describing those three techniques, I do wonder if it doesn’t make things more complicated than they are if you are actually splitting the YO into three different ones. Anyway, back to my jumper and the amazing new technique. This techique is incredibly useful, if you are supposed to k2tog first and next a – lets call it neutrally – YO which will then both purled together through the back loop (p2tog tbl) in the next row. It is especially useful if the recommended yarn is a pain to knit (cotton fibres with one silk thread wrapped around to hold it together) and makes the p2tog tbl virtually impossible. And lets say that you have to repeat that p2tog tbl to the end of row and for about a million of rows. Then the YOB comes in really handy. When you are on the wrong side of your work and have to do the p2tog tbl, the newly created loop leans actually the other side which makes it so much easier to get through both stitches from the back. I honestly would not have knitted that whole jumper if I had not accidentally invented YOB. Before checking out the differences of yfwd and yrn, I had done it correctly and it was a fight to get the needle through. It was as if I had never knitted before and each stitch was difficult to form. I would definitely not have done that for such big sections. 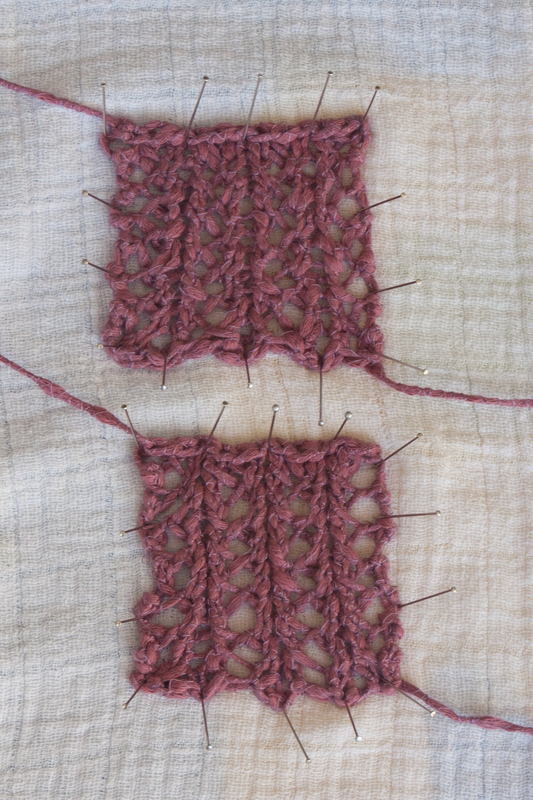 I have also knitted two samples of the ribbed section, once with yfwd and once with yob, to see the differences. Once they were knitted I could not see any, when I stretched them out, I would say that the bottom one (yfwd) is actually a bit neater. I tried again with a plain cotton yarn to see if that would make any difference. P2tog tbl with one of the two stitches being a yfwd created in the previous row is still annoying but not as fiddly as with the Rowan Savannah and it is still a bit neater. Yob again on top, yfwd at the bottom. 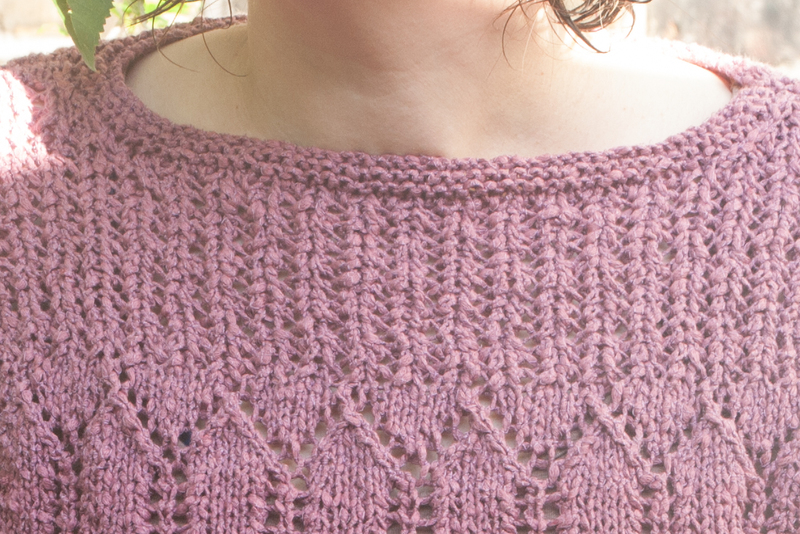 So, when opened up, there seams to be a difference in regularity (probably because there is no flow whatsoever when doing the purl row of the yfwds and you have to work hard each time) but I don’t think it makes any difference in the actual jumper. So as a conclusion, yob turned out a very useful mistake, as the p2tog tbl is certainly much easier to be executed and I can only recommend it for this particular project. I do however wonder if this is really the only way to get this bold ribbed look or if there would have been a much simpler way for a similar effect…. but that is a completely different question. This entry was posted in adults, patterns written by others, tutorial and tagged Knitting, Navajo, tutorial, yo by atelieroursonne. Bookmark the permalink. I couldn’t find the line, but the top is very beautiful nonetheless.